Aluminum Vacuum Chambers | Meyer Tool & Manufacturing - Meyer Tool & Mfg. Aluminum is becoming a more and more popular choice for Ultra High Vacuum, (UHV), applications. Aluminum's low material cost and easy machinability makes an ideal choice for some vacuum chamber designs. 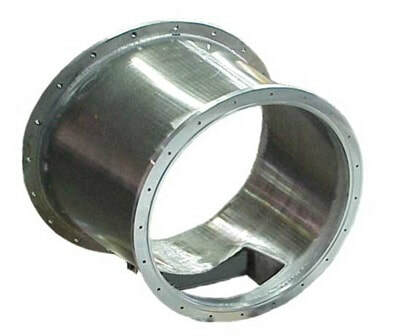 Aluminum chambers that utilize a large number of ports that have to transition to Stainless Steel using bi-metal fittings, in some cases, may be better off with Stainless Steel. Although Stainless Steel is a more expensive material it is much easier to weld and there is no need for costly bi-metal transitions. Meyer Tool has experience building a wide range of custom Aluminum Ultra High Vacuum chambers in all shapes and sizes. We have added heating elements and cooling jackets depending on specific customer requirements. In all cases we are able to machine the chambers to precise dimensional tolerance and produce ultra high vacuum quality welds.